With interest in motorcycles on the rise in the western world, there’s never been so much gear to choose from. Which is making it harder and harder to pick out noteworthy items for our occasional round-ups. 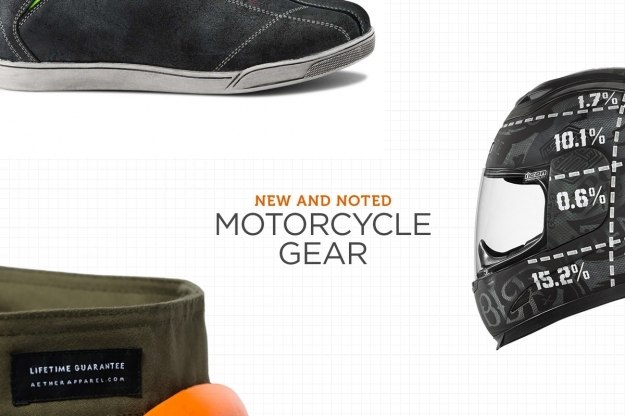 This time, we’ve got a helmet with a darkly humorous message, a motorcycling app that actually works, and a pair of urban riding boots that might just be the best mix of form and function yet devised. Hide that credit card now. 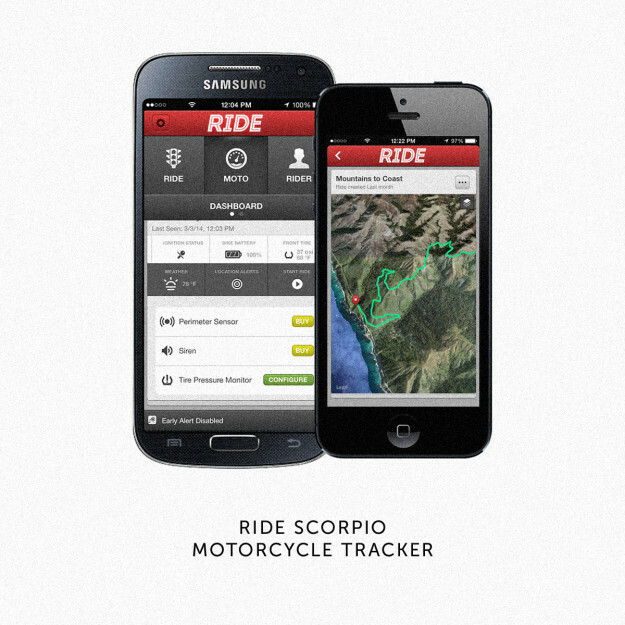 Ride Scorpio motorcycle tracker There have been lots of motorcycling apps developed for smartphones, but this is the first one we’ve seen that looks truly compelling. It uses GPS for sophisticated ride capture data—but it can also send you a text message if your bike is stolen, knocked over, or moved outside a pre-set area. The brains of the system are contained in a small module that fits any bike with a 12-volt electrical system. You can also expand the system’s capabilities by adding extra components—like tire pressure sensors that screw into your valve caps, and warn you if the pressure gets too low. At $219 plus a monthly data fee of $10.95 the Ride Scorpio is not cheap—but how much is your ride worth? 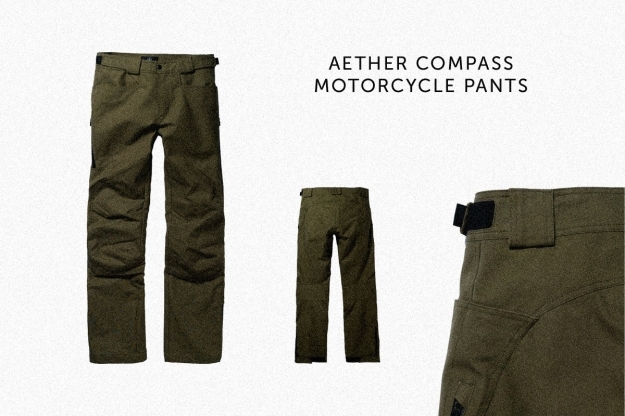 Aether Compass motorcycle pants Aether is a big player in the high-end technical apparel market, and is now expanding its motorcycle range. The $475 Compass is the latest product to hit the shelves, a stylish pant constructed from heavy-duty Scottish canvas that has a ‘natural’ feel but good abrasion resistance. There’s removable D30 armor for the hips and knees, and an adjustable waistband with velcro straps. There’s also a lot of attention to functionality, such as being able to access the pockets without squirming around while sitting on the bike. The style is clean and contemporary, and like most of Aether’s creations, not immediately recognizable as motorcycle gear. 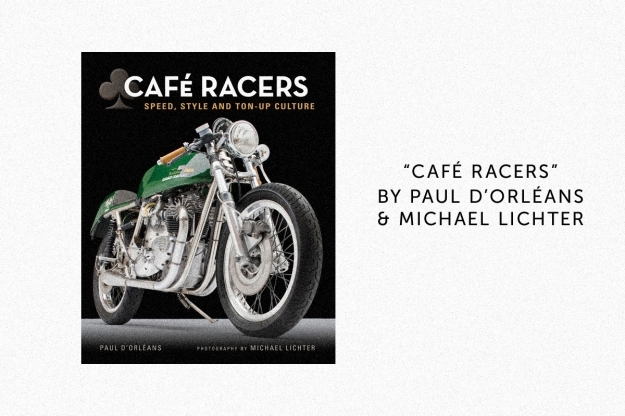 Café Racers by Paul d’Orléans and Michael Lichter If you enjoyed Paul’s crisp, perceptive writing in our own book The Ride, take a look at his latest work—a joint project with one of the top US motorcycle photographers, Michael Lichter. The publisher Motorbooks describes Café Racers as “A photographic chronology of some of the fastest, most stylish, and most individualized bikes in motorcycling history.” So fresh my own copy has not arrived yet—but I’ll be ripping off the packaging in haste when it lands in the mailbox. 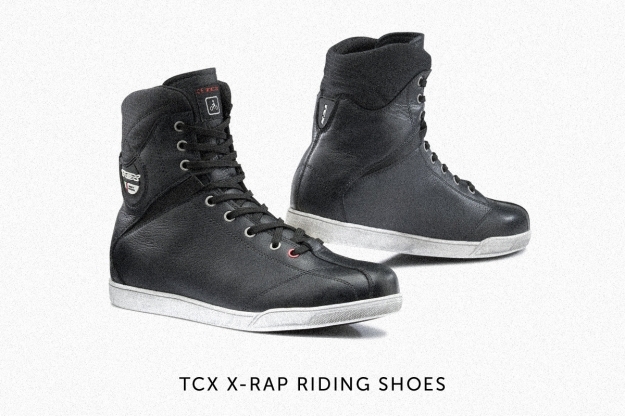 TCX X-Rap riding shoes There’s a perennial problem with choosing riding gear: if you’re just popping down to the shops or commuting to work, do you really need to go ATGATT or don an Aerostich onesie? Mainstream gear design is mostly about compromise: building in as many safety features as possible without making the owner look like a dork. In the footwear world, the Italian company TCX understands this better than most. The CE-certified X-Rap is a short, full-leather waterproof boot with a hint of Converse styling, but enough ankle, toe and heel reinforcement to make it suitable for short urban rides. Good value at $150.